Lori Gayle Therapy — Garriott Design Co.
Lori is a lovely therapist from the Northeast. I love when clients reach out to me from my Northeastern roots. Lori needed a brand and a website to help her spread the word about her new private practice. We knew we wanted to pull in purple hues, but other than that Lori didn’t have much of a basis to start the concept process with. I decided I wanted to include illustration and beautiful type in her brand. We considered icons such as hands, speech bubbles, and natural, foliage-related iconography. One of the plant-based concepts was an olive branch, representing the kindness, helpfulness, and trustworthiness of Lori’s character and services. We brought in beautiful and approachable imagery throughout her site, to help relieve some of the weight of the issues that Lori’s therapy services help to address. Our goal was to evoke a mood of calmness and open mindedness. Lots of white space, curated copy, and ease of navigation meet these goals. 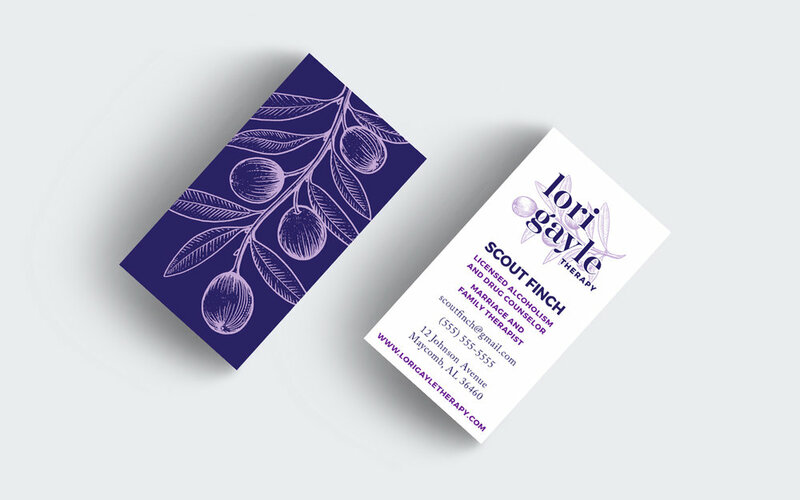 In the print realm, we have so far developed business cards and rack cards for Lori. These apply the olive branch illustration as its own graphic element, along with similar white space and textual clarity as is found on the website. Caroline developed my website, rack cards and business cards. From our first phone call, she was friendly, professional and dedicated to helping me meet my goals. I really liked her availability to me. She would invite me to video calls which provided a personal connection and she was open to my feedback as well.